toon|Audio Tone Generator for iPad Support - toon,llc. "Audio Tone Generator for iPad" is a high quality Audio Signal Generator app for iPad. It creates the Audio Reference Signals as Sine waves, Frequency Sweep, White Noise and Pink Noise, and has a high precision of DVD quality and a frequency accuracy of 0.1Hz. It will help you to make the benchmark for your audio equipment and loudspeakers, your listening environment and room acoustics or your hearing. The signals created by this app can be best used in conjunction with external devices, such as an audio spectrum analyzer or a sound level meter. In addition, it can generate Octave band noise in 1/1 or 1/3 octave band. Octave band noise can be used for various purposes as a reference sound source for environmental sound measurement, sound tuning, auditory effects like tinnitus relief and sound masking. Please to click the following link to download "Audio Tone Generator for iPad" from App StoreTM. It will be open the download page on App StoreTM. Release date : May 16, 2018　UTC. Recommendation : Compatible with iPad. Requires iOS 11.3 or later. This app can generate the following signals. Sweep Time Control : 10 seconds to 180 seconds. Pause function on SWEEP mode. Noise generation on NOISE mode : White Noise or Pink Noise. Octave band noise generation on NOISE mode : 1/1 or 1/3 octave band. Burst signal generation on NOISE mode : None, 1, 2, 5 10 sec. Supports of frequencies range between 20Hz to less than 23999.9Hz. Direct frequency input by the keyboard. Optimized for iPhone, Compact code size. Testing and tuning for Audio amplifiers, Equalizers and many other Audio equipment. At the time of starting the app "Audio Tone Generator for iPad", Top View will be displayed. Top View has Mode selection area at the top, Operation panel area in the middle and Control area at the bottom. 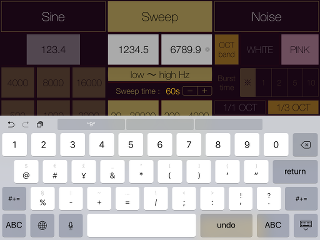 First, in the mode selection area, select one of four operation modes: sine wave (Sine), Frequency sweep (Sweep), noise (Noise), app information (Information). In Operation panel area, the selected Operation panel is moved to the center position and displayed, and each parameter settings becomes possible. In Control area, there are Play, Stop, Sound volume, Output channel selection (LEFT & RIGHT, LEFT, RIGHT) and Phase inversion. In the time of starting this app, you can see the operation setting area at the top, and the control area at the bottom. In the control area, you can select one operating mode from Sine-wave mode(SINE), Sinewave sweep mode (SWEEP) and noise mode(NOISE). In addition, you will be able to control the playback volume, Play/Stop and Output channel. In the operation setting area, you can see the parameter of the operating mode that has been selected in the control area. This mode is used to generate Sinewave signal. If you touch the frequency display monitor, it is possible to use the keyboard. In keyboard input, you should set a frequency of 23999.9Hz from 20.0Hz. It should note that the initial value is not entered at the application startup, you will need to be set the frequency of up to one decimal place. Further, the signal can be set from frequency of the eight types by tapping a preset button. It generates a tone signal by PLAY button, and stops by STOP button. This mode is used to generate White and Pink noise. You can select one of either Pink or White noise. It generates a signal by PLAY button and stops by STOP button. The amplitude of white noise is constant throughout the audible frequency range. Twice the power corresponds to 3 decibel increase, so white noise is said to increase 3 dB per octave in power. Pink noise is filtered to give equal power per octave or equal power per 1/3 octave. The power of pink noise per Hz of bandwidth decreases by 3 decibels per octave. When pink noise is chosen for equalizing auditoriums, the real-time analyzer can be set up so that they display a straight horizontal line when they receive pink noise. In addition, it is possible to generate the burst signal by selecting one of 1, 2, 5, and 10 seconds with "Burst time". The duty of the burst signal is 50%. 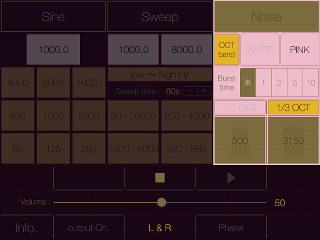 In NOISE mode, Octave band noise can be generated. It can also be used for detailed analysis of specific frequency band. Octave band noise is generated a frequency limited band signal by using the band-pass filtering of 1/1 octave band or 1/3 octave band. It can be used in order to measure and evaluate the sound level of a certain frequency band on the basis of the octave. This app can output a noise signal that are processing the source signal of White noise or Pink noise with the octave band pass filter. By tapping "OCT band" button, octave band noise generation function becomes effective. In addition, by tapping either "1/1 OCT" or "1/3 OCT" buttons and select one center frequency of the band pass filter. At this time, the center frequency of the selectable bandpass filter is as follows. By tapping "Info." button, it is displayed the product information. If you tap the "Support/Information", Safari starts and you can see our support page. If you return the operation, please tap the other Mode button. 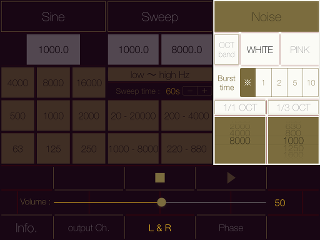 Audio Tone Generator for iPad version 4.1 was released on May 15, 2018. * Changed Noise filtering to Octave band noise generator, UI design change, iOS 11.3 support, performance improvement. 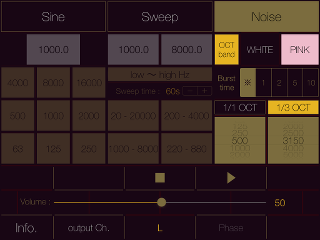 Audio Tone Generator for iPad version 4.0 was released on December 4, 2016. 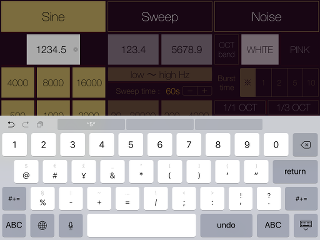 * Added filter frequency setting function, UI design change, iOS 10.1 support, performance improvement. 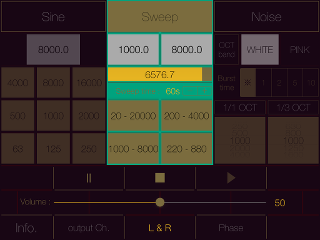 Audio Tone Generator for iPad version 3.1 was released on March 9, 2016. 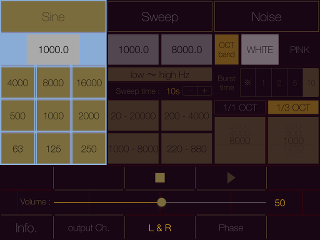 Audio Tone Generator for iPad version 3.0 was released on October 19, 2015. * Selection of the output channel. Phase Inversion in STEREO output. Add Filter Processing to NOISE mode. Correspond to iOS9. Audio Tone Generator for iPad version 2.1 was released on July 9, 2015. 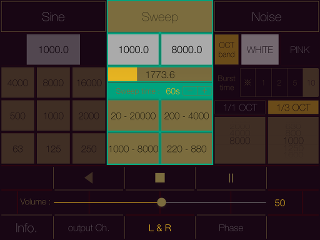 Audio Tone Generator for iPad version 2.0 was released on May 7, 2015. * Addition of Preset frequencies. Changed UI design. Code Optimization. Correspond to iOS8. 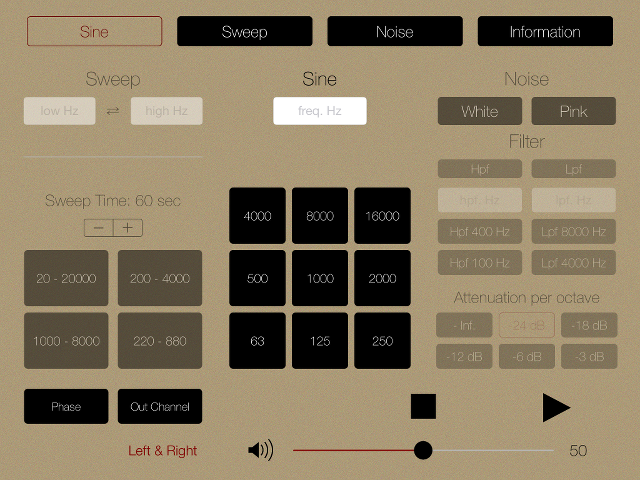 Audio Tone Generator for iPad version 1.3 was released on April 28, 2014. * Addition of Warble tone generation. Changed UI design and App name. Correspond to iOS7.1. AudioTGtab version 1.2 was released on November 26, 2013. AudioTGtab version 1.1 was released on October 18, 2013. AudioTGtab version 1.0.0 was released on June 14, 2013. On the keyboard-input of frequency, please press the return key after entering a numeric value. Also, in Sweep mode, please press the return key after entering two numeric values continuously. Wireless connection with Bluetooth equipment is not supported. If the silent mode is turned on, all sound outputs are disabled. To enable the sound output, please be sure to turn off the silent mode in the iPhone' settings, "Settings/Sounds" or Control Center. o improve our products. Thank you for your cooperation.